Embroidered Monkey Wrench, made for Jack, son of Kris and Chris Williams. Embroidered Ohio Star, made for Lily, daughter of Kris and Chris Williams. Balloons and Animals, made for Reece's Rainbow, an International Down Syndrome Orphan Ministry, when Jim and Nicole Gallagher adopted their daughter Shreya. Bears and Pinwheels, made for Tobias, son of Jimmy and Ashley Allen. Elephants and Stars, made for Connor, son of Chris and Candace Moore. Baby Toys, made for Nessa, daughter of Vernon and Amy Deas. Rocking Horses, made for Carson, son of Jason and Bethany McKenzie. Winnie the Pooh, made for Anna Rogers. Safari Animals, made for Vivian, daughter of John and Danae Schonberg. Crayons, made for Langdon, son of Kristopher and Barbara Smart. Travelling Bunnies, made for Donald, son of Nathanael and Heidi Schonberg. Winnie the Pooh in Stars, made for Philip and Kendra Oberzan. Beatrix Potter, made for C.J., son of Micah and Christina Williams. Pastel Teddy Bears, made for Dan and Laura Nelson. Purple Bears and Flowers, made for Kyla Herbert. Alphabet Bears. 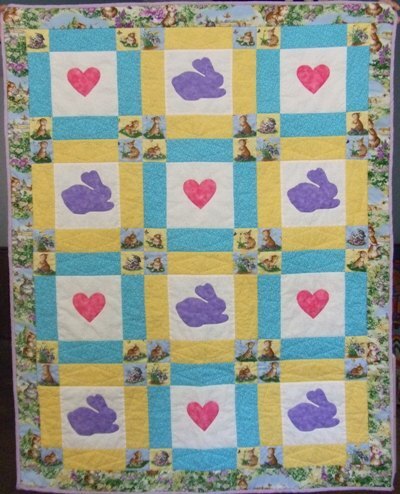 Easter Bunnies and Hearts, made for Nancy Yockey's grandchild. Bunny Family, made for Luke and Dana Rogers. Ducky Pull Toys, made for Oliver, son of Kris and Chris Williams. 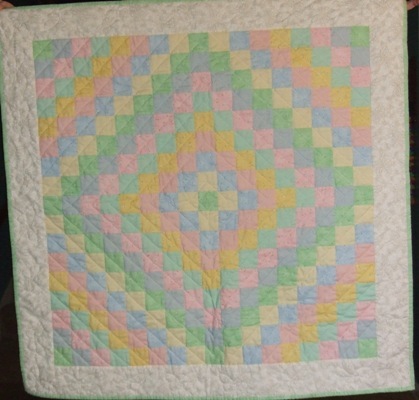 Geometric Baby Quilt, made for Grayson, son of Chris and Melissa Imm. Sunbonnet Sue and Overall Bill, made for Jacob, son of Doug and Sonia Everhart. Bears and Balloons, made for Mary, daughter of Steve and Paula Runyan. Counting Bears, made for Carol Wandel's niece. Pastel Around the World, made for Asher, son of Billy & Fanta Christy. Bunnies for Baby, made for Adele, daughter of Jennie Drumheiser. 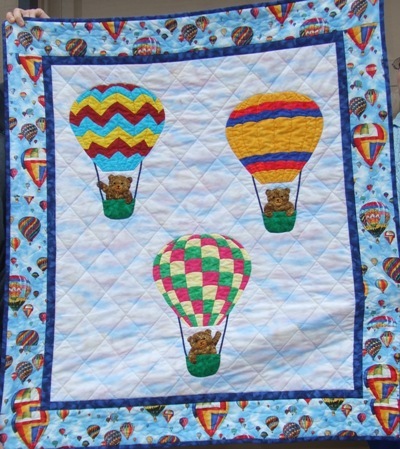 Hot Air Balloons, made for Alicia Jamison's child. Lollipop Train, made for Theodore, son of James and Rebecca Snow. Rainbow Pinwheels, made for Audrey, daughter of Zach and Angela Sloan. Summer Leaves, made for Anna, daughter of Matthew and Cecilia Harvey. Turtles on the Move, made for Simeon, son of Justin and Stephanie Brown. Bears in Flight Puppies and Kittens, made for Aaron, son of Xianping Li and Iris Zhou. Bunny and Bear Friends, made for Tyler and Jacky Hicks. Nine Patch, made for the Children's Hospital of Lincoln, Nebraska. Bunnies at Play, made for Filip Štok. Strawberry Bears, made for Chris and Laura Macris. Taxis and Cars, made for Apollos Burr. Taxis and Cars (back side), made for Apollos Burr. 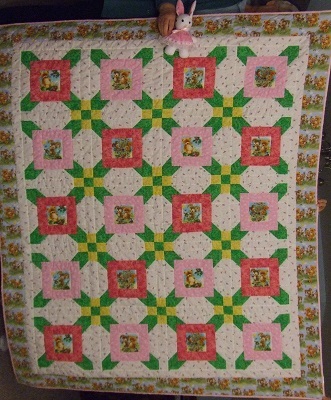 Bears and Bunnies, a larger quilt made for Adele Drumheiser. Baby Elephants, made for Crystal.